I will open my mouth with illustrations.—Matt. 13:35. Some believe that Satan is “in charge” of hellfire. We could ask them: “Imagine that your child has become very rebellious and is doing many bad things. How would you react?” Likely, the parent would say that he would correct his child. But what would he do if the child rejected all efforts to help him? Most parents would say that eventually they would have no choice but to punish the child. We could then ask, “What if you found out that an evil person had influenced your child to become so rebellious?” No doubt, the parent would be angry with such a person. Driving home the point of the illustration, we might ask the parent, “Knowing that an evil individual had influenced your child, would you ask that person to punish your child for you?” The answer, of course, would be no. Clearly, then, God would not use Satan to punish the very same people who have been influenced by the Devil himself to do bad things! Jesus was a masterful storyteller. His illustrations are timeless and true and always drove home a profound lesson – ultimately revealing some aspect of Jehovah’s future judgments. The Watchtower needs to work on it. Of course there is no subterranean inferno where Satan tortures hapless souls in eternity for a few misspent years on earth. But, the underlying premise of Bethel’s illustration is definitely not valid. Jehovah does allow Satan to punish his people even though the Devil is responsible for misleading them in the first place. This is a fundamental, biblical principle. Paul demonstrated this very thing when he commanded the Corinthians to put a brazen fornicator out of the congregation, saying: “hand such a man over to Satan for the destruction of the flesh, so that the spirit may be saved in the day of the Lord.” Being handed over to Satan meant that Jesus would no longer protect and watch over such a man. Although God took responsibility for meting out the punishment, he personally did not administer it. As stated above, their punishment came in the form of “the stroke of an enemy,” from “someone cruel.” In reality the Jews were besieged by the merciless Babylonian hordes. Their cities were destroyed. Their homes ransacked and pillaged. Solomon’s magnificent temple was demolished. The survivors were dragged off in chains to Babylon, the then-capital of Satan’s earthly empire. God abandoned his people and allowed the Devil to mistreat them. 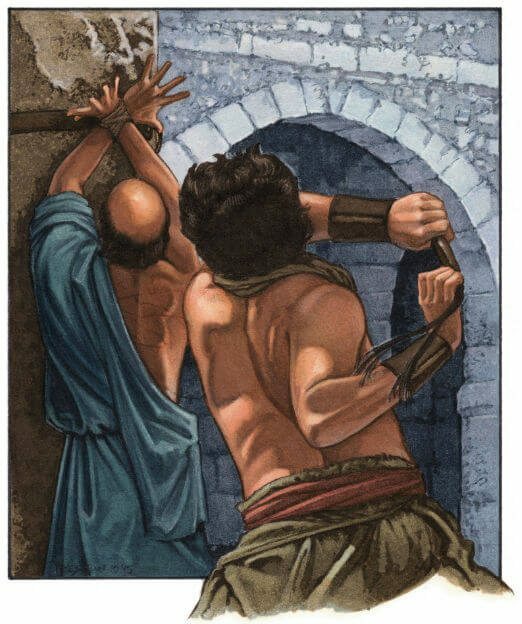 Clearly, Jehovah does use Satan to administer discipline —completely counter to the premise of the Watchtower’s illustration. But happily, Jehovah did not allow the enemy to exterminate the Jews —they were disciplined to the proper degree. In the ancient setting the discipline achieved the desired result. The Jews returned to Jerusalem and rebuilt Jehovah’s temple and never again took up the worship of Molech or Chemosh or any of the other demon Baals. Jesus referred to the tribulation as being unlike any time if distress that has ever before occurred or will ever occur again. But, on account of the chosen ones God will cut it short. That is the time of Jacob’s trouble, as some translations word it. Nevertheless, “Jacob” will be saved out of it. Then is when Jehovah will cause an outright extermination of the nations so that they will no longer even exist. Unfortunately for them, the leadership of the Watchtower has a lot more to work on than merely the proper use of illustrations.